Not a Home Equity Loan. Enter the current balance of your home equity line of credit (without the dollar sign). If you want to calculate the interest-only HELOC payment for the total line of credit you qualified for, enter that amount instead. Enter the annual interest rate of the home equity line of credit (without the percent sign). If you would like the HELOC payment calculator to calculate the principal and interest payment that will begin once the draw period is over, enter the number of years to repay the line of credit. This is your monthly interest-only HELOC payment. This is the principal and interest payment that will take effect once the draw period has expired. This free online calculator will calculate the monthly interest-only HELOC payment given your current balance, plus calculate the principal and interest payment that will take effect once the draw period expires. 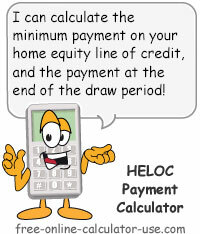 If you would like to calculate the size of the home equity line of credit you might qualify for, please visit the HELOC Calculator. Enter the balance of your current line of credit. Enter the home equity line of credit interest rate. Enter the number of years to repay the principal once the draw period expires. Click the "Calculate HELOC Payment" button. What is HELOC, advantages, disadvantages, and how it compares to a home equity loan. In case you're not familiar with the acronym, HELOC stands for Home Equity Line of Credit. A HELOC is similar to a revolving charge account, where you can borrow from the line of credit as you need cash over the course of what's known as the draw period. During the draw period you will usually have the option of making interest-only payments. Later, at the end of the draw period (usually 5-10 years), your monthly payment will increase to include principal repayments. The size of the home equity line of credit you may qualify for is typically based on the appraised value of your property, the amount you owe on your property (total of 1st mortgage, 2nd mortgage, home equity loan), and the loan to value (LTV) the lender is willing to extend to you. Just to be clear, a Home Equity Line of Credit is not the same thing as a Home Equity Loan. A Home Equity Loan is more like a traditional mortgage in that you borrow a specific amount and make fixed monthly payments over a fixed period of time. The main advantages of a home equity line of credit are that most lenders don't charge any closing costs, and you only pay interest on the portion of the line of credit your are using -- not on the total amount of the line of credit you qualify for. And, unlike revolving charge accounts, you may also be able to deduct the interest payments. One disadvantage to home equity lines of credit is that you will usually pay a higher interest rate than you would for a home equity loan. Also, because a home equity line of credit is similar to a revolving charge account, if you're not careful you can get into the same kind of debt trouble that credit card abuse can lead to.